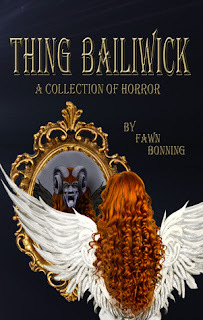 Offering up a healthy mix of surreal creepiness, psychological weirdness, and physical terror, Thing Bailiwick is a collection of well-written horror that deftly demonstrates Fawn Bonning's literary skills. 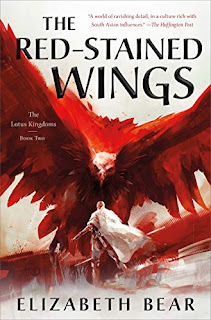 I won't run down all the stories - to do so would be to spoil the thrills and chills - but let me share with you some thoughts on the first few. The collection opens with a story of a sad, lonely, emancipated dog, found dying alongside the road . . . or is it already dead? 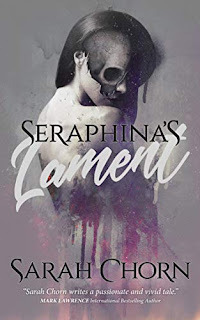 You'd think it would be a simple question to answer, but not so much for one young mother, who tragically finds out that no good deed goes unpunished. A bloody, unsettling tale from start to finish. Next, we're introduced to a group of young punks who foolishly choose to torment an old man who wants nothing more than to sit and feed the birds. It's a story comprised largely of dialogue, but there's some character development along the way that makes the supernatural twists at the end all the more powerful. From there we turn to a darkly humorous tale of two young thieves and the sarcastic old woman they make the mistake of robbing. This one is a more traditional a narrative, complete with some skin-crawling descriptions of disembodies eyes, but the banter between the old woman and the thieves is what makes it so entertaining. A group of young men are at the heart of the next story as well, but there's no torture or thieving involved here, just some innocent bullying . . . and, well, a whole lot of fear. As soon as the challenge comes to spend the night in the forest fort, you know it's not going to go well, but they way the claustrophobic terror builds here is very different from the first few stories. I'll leave you to discover the rest for yourself, but suffice to say Thing Bailiwick is a surprisingly strong collection that delivers consistent chills. 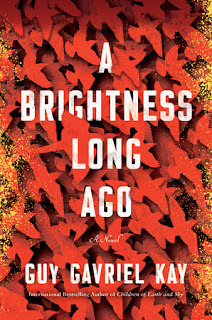 There's an air of mystery throughout, with certain details left off the page, and many of the conclusions somewhat open-ended, but that's part of what appealed to me. Leaving something to the reader's imagination is key to effective horror, and loose ends are what keep the fear alive. Disclaimer: I received a complimentary copyof this title from the author in exchange for review consideration. This does not in any way affect the honesty or sincerity of my review.